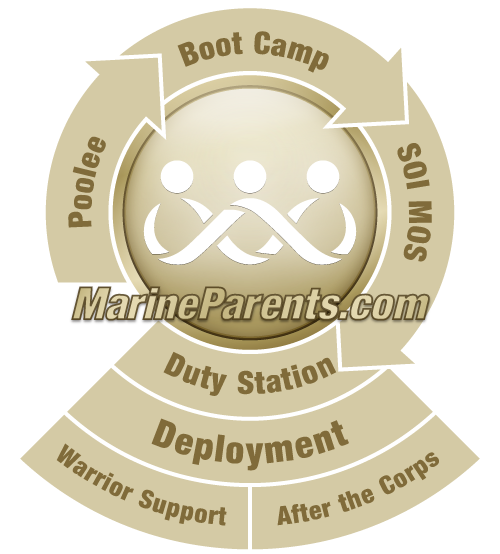 Our website MarineParents.com, was founded in January of 2003 and offers education and support for parents, spouses, and loved ones of U.S. Marines. Education and support is available for each stage of your Marine's career in the Corps, including bootcamp, School of Infantry, training, active duty, deployments, and transitioning out of/life after the Corps. To date, MarineParents.com, Inc. has touched the lives of more than 3 million Marines and family members, shipped more than 40,000 care packages to combat-deployed troops, sent more than 100,000 cards and letters to injured Marines, and actively encouraged community awareness for supporting our troops through the Warrior Support Team™, Team Marine Parents™, Marine Parents Travel Assistance, and the Luminary Initiative. Our outreach programs have been the main focus of the organization since its founding and have changed through the years based on the needs of Marines and the family members we support. We have countless stories that can be told about our outreach. We encourage you to read some of our stories here: https://marineparents.com/troops. MarineParents.com, Inc. is under the management of the Founder and Executive Director, Tracy Della Vecchia, and is based in Columbia, Missouri. Tracy works with aproximately fifteen full-time employees in addition to working with hundreds of volunteers from around the United States. The 10-member Board of Directors meets regularly and includes Marine parents and active duty Marines. Due to the growth of the organization, operations moved to a permanent office space in 2009. Benefactors donated over $250,000 in supplies and labor to build our corporate office. Due to their generosity, Marine Parents was able to ship its care packages from its own warehouse for the first time ever later that year. The organization's websites receive over 130,000 unique visitors each month. More than 50,000 people receive one or more of our electronic newsletters each week. The organization has been featured in the New York Times Sunday Magazine as well as numerous local and national newspapers, on television newscasts with CBS, NBC Nightly News, CNN, CNN International, and Fox News, as well as being featured on numerous radio stations and shows including the Tony Snow Show, NPR (National Public Radio) and the other nationally syndicated talk show radio programs. Effective August 30, 2004, MarineParents.com, Inc. is an IRS recognized 501(c)(3) public charity. December 7, 2004, President George W. Bush presented the President's Volunteer Service Award to Kathryn Ostapuk when he arrived in Miramar, California on Tuesday, December 7, 2004. At the time, Ostapuk, age 24, was an active volunteer with MarineParents.com, and is now currently pursuing her education in California. Founder Tracy Della Vecchia had the honor of meeting General Hagee, Commandant, USMC, in July 2005. General Hagee personally thanked Tracy for her service to the Marine Corps families and presented her with the Commandant's Coin. Secretary of Defense, Donald H. Rumsfeld, sent a letter in February of 2006, expressing his appreciation to the organization for invaluable support to our men and women in uniform.